Abruzzo is a region of Southern Italy bordering Marche to the north, Lazio to the west, Molise to the south-east and the Adriatic Sea along its coast. Until 1963, Abruzzo was part of the Abruzzi e Molise region (with Molise). The term Abruzzi is an obsolete plural denomination from a time when the Bourbons administered the territory as "Closer Abruzzo", Abruzzo Citeriore and "Further Abruzzo", Abruzzo Ulteriore. The regional capital is L'Aquila. 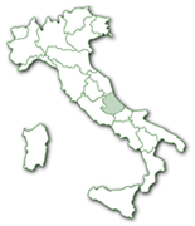 The region is divided into four provinces: L'Aquila, Teramo, Chieti and Pescara, Abruzzo's main economic centre. Abruzzo has a population of around 1.3 million. Abruzzo's subterranean waterfalls with dramatic natural lighting from openings in the cave walls. Rich with local culture and traditions - a highlight of the year for locals. Wide sandy shores, high jagged cliffs, narrow creeks & pebble beaches. 130km of coast for all tastes. The cuisine in Abruzzo varies from province to province reflecting the climate of the area.